Default calendaring solution for all staff and faculty fully supported by OIT. Accessible via Outlook client, Outlook on the Web Calendar App, and Outlook Mobile App (Android and iOS). You can easily share your calendar with other people in the organization. Unable to access shared calendars on mobile devices (including the Outlook App). Available for students, faculty, and staff. Unable to access Google Calendars in Outlook Client or Outlook on the Web. Must log in to Google using UTK credentials for access. Staff and Faculty have full access to Google Calendar, however it does not integrate with the Office 365 system. Resource mailboxes are mailboxes that represent conference rooms, shared equipment, or absences. Resource mailboxes provide a simple and efficient way to utilize resources for a workgroup or department. 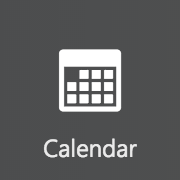 A Resource Mailbox has its own calendar, which can be viewed and modified just like a persons calendar. A Resource Mailbox can be set up to handle reservation requests in one of two ways: Moderated and Auto-Accept.